Mild, non-ischemic heart failure might be more deadly than thought, an Austrian group found, calling for broader ICD use. Pacemakers place one or more wires into heart muscle to trigger electro-mechanically coupled contraction. A single wire to the right atrium is called an AAI pacemaker (atrial sensing, atrial triggering, inhibit triggering if sensed). A single wire to the right ventricle is called a VVI pacemaker (ventricular sensing, ventricular triggering, inhibit if sensed). With two wires to the heart more combinations are possible, including atrial-ventricular sequential activation, a closer mimic to normal function (DDDR pacemaker: dual sensing, dual triggering, dual functions, and rate-responsive to mimic exercise adjustment of heart rate). Three wires are used for synchronization: one to the right atrium, one to the right ventricle apex, and a third lead into a distal branch of the coronary sinus to activate the far side of the left ventricle. Resynchronization is used to compensate for a dilated ventricle, especially one with conduction delays, where the timing of activation is so unbalanced that the heart contraction approaches a wobbling motion rather than a well coordinated contraction. Adjusting timing of activation of the right ventricle and left ventricle can offset dysynchrony (unbalanced timing) and thereby increase the amount of blood ejected by each heart beat contraction (ejection fraction). Patients with dilated cardiomyopathy and significant conduction delays can improve the ejection fraction by 10 or more percentage points, which offers a significant improvement in exertion tolerance and heart failure symptoms. Patients with ejection fraction below 35%, among others, have an elevated risk of life-ending arrhythmias such as ventricular tachycardia. Ventricular tachycardia is an extreme example of a wobbling heart in which the electrical activation sequence circles around the heart sequentially activating a portion and blocking its ability to respond until the electric signal comes around again. Whenever a portion of the heart is activated, ions shift location, and further activation of that region is not possible until sufficient time passes so that the compartmentalized ion concentrations can be restored (repolarization). Pacing can interrupt ventricular tachycardia by depolarizing a region that supported the circular activation pattern. Failing that, an electric shock can stop an ineffective rhythm. After all regions stop activation, they will generally reactivate in the normal pulsatile synchronous manner. An implanted cardiac defibrillator is a device designed to apply an internal electric shock to pause all activation and thereby interrupt ventricular tachycardia. Lead Displacement – The Lead moving away from the heart tissue and thus becoming pretty useless. Vascular/Organ Injury – Damage to the blood vessels being used for access or perforation of heart wall. Pneumothorax (damage to the lining around the Lung), Haemothorax (build up of blood in the chest cavity), and air embolism (air bubble trapped in a blood vessel). These complications are one of the key motivations behind developing ‘leadless’ devices the first of which the St Jude Nanostim, a small VVI Pacemaker that fits directly into the heart. What is the Boston Scientific S-ICD? The S-ICD is what is sometimes referred to as a ‘shock box’ it does not have the pacemaker functionality that many other ICD’s do have. It is ONLY there to terminate dangerous Arrhythmias. It is not a Pacemaker! Without the lead(s) ENTERING the heart via a blood vessel there is a reduction in the risks mentioned previously that are associated traditional device. Another of the benefits is that the S-ICD is positioned and implanted using anatomical landmarks (visible parts of your body) and not Fluoroscopy (video X-Ray) which reduces radiation exposure to the patient. The ‘Can‘ (metal box that contains all the circuitry and battery), is buried under the skin on the outside of the ribs. Put your arms down by your sides, the device would go where your ribs meet the middle of your bicep. A lead is then run under the skin to the centre of your chest where its is anchored and then north, under the skin again until the tip of the lead is roughly at the top of the sternum. 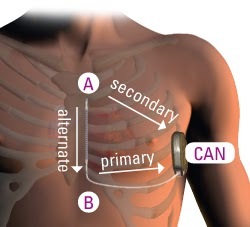 For you physicians out there the ‘can’ is positioned at the mid-axillary line between the 5th and 6th intercostal spaces, the lead is then tunnelled to a small Xiphoid incision and then tunnelled north to a superior incision. 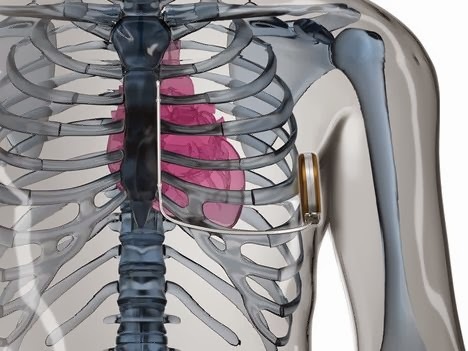 How is an S-ICD Implanted? Having spoken to Boston Scientific it is becoming more apparent that the superior incision (cut at the top of the chest) may actually be removed from the procedure guidance as simply tunnelling the lead and ‘wedging’ the tip at that point is satisfactory – THIS IS NOT CONFIRMED AT THE MOMENT AND IS THEREFORE NOT PROCEDURE ADVICE. 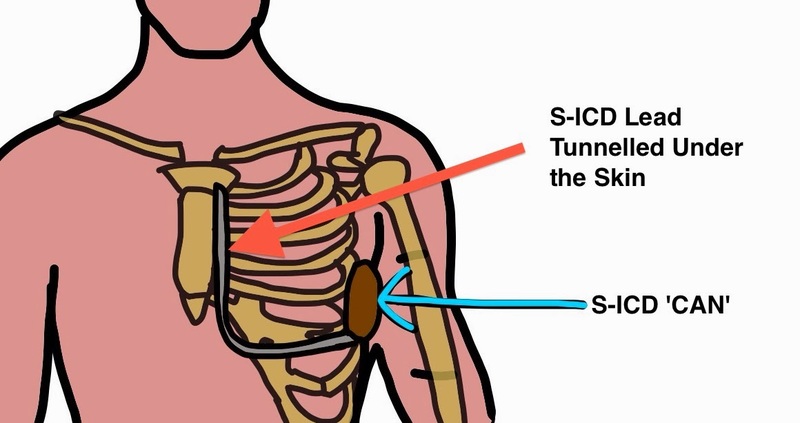 How does the S-ICD Work? A ‘Shock Box’ basically needs to do 2 things. Firstly be able to SENSE if the heart has entered a Dangerous Arrhythmia and Secondly, be able to treat it. The treatment part of the functionality is the easy bit – it delivers an electric shock across a ‘circuit’ that involves a large amount of the tissue in the heart. The lead has two ‘electrodes’ and the ‘Can’ is a third electrode allowing you different shocking ‘vectors’. By vectors we mean directions and area through which the electricity travels during a shock. This gives us extra options when implanting a device as some vectors will work better than others for the treatment of dangerous arrhythmias. This is a concept you are familiar with without even thinking about it… when you are watching ER or another TV program and they Defibrillate the patient using the metal paddles, where do they position them? One either side of the heart? Precisely!! this is creating a ‘vector’ across the heart to involve the cardiac tissue. The paddles would be a lot less effective if you put one on the knee and one on the foot! Now because the ‘Vectors’ used by the S-ICD are over a larger area than those with a traditional device – more energy has to be delivered to have the same desired affect. The upshot of this is that a larger battery is required to deliver the 80J! Bigger Battery = Bigger Box. This image shows a demo device but this is the exact size compared to a One Pound Coin! Now yes it is big but because of the extra room where they place the device it is pretty discrete and hidden in even slender patients. The S-ICD System delivers up to 5 shocks per episode at 80 J with up to 128 seconds of ECG storage per episode and storage of up to 45 episodes. The heart rate that the S-ICD is told to deliver therapy is programable between 170 and 250 bpm. Quite cleverly the device is able to also deliver a small amount of ‘pacing’ after a shock, when the heart can often run slowly. This is external pacing and will be felt!! It can run for 30s. The S-ICD uses its electrodes to produce an ECG similar to a surface ECG. Boston Scientific have come up with a very clever software/algorithm called ‘Insight’. 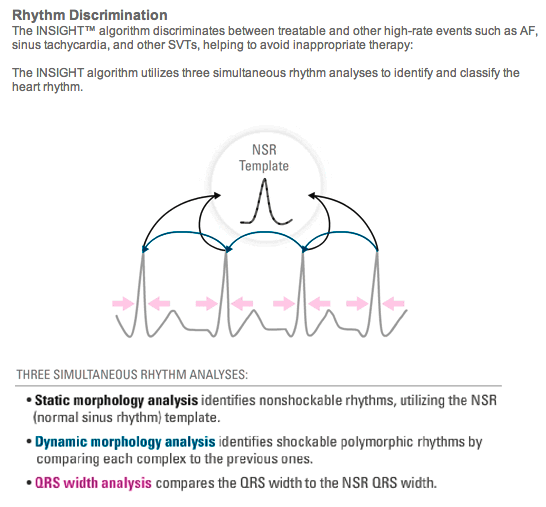 Insight uses 3 separate methods to determine the nature of a heart rhythm. These questions (with some very complex maths) and the rate of a rhythm are used to decide whether to ‘shock’ or not. How does Insight and the S-ICD compare to other ICD Devices? 1. Burke M, et al. Safety and Efficacy of a Subcutaneous Implantable-Debrillator (S-ICD System US IDE Study). Late-Breaking Abstract Session. HRS 2012. 2. Lambiase PD, et al. International Experience with a Subcutaneous ICD; Preliminary Results of the EFFORTLESS S-ICD Registry. Cardiostim 2012. 3. Gold MR, et al. Head-to-head comparison of arrhythmia discrimination performance of subcutaneous and transvenous ICD arrhythmia detection algorithms: the START study. J Cardiovasc Electrophysiol. 2012;23;4:359-366. Template used to assess eligibility! Well essentially anyone who qualifies for a normal ‘shock box’ ICD but with one other requirement. The Insight Software requires that a person has certain characteristics on their ECG. This is essentially showing that they have tall enough and narrow enough complexes to allow the algorithm to perform effectively. A simple 12 lead ECG Laying and Standing will be obtained and then a ‘Stencil’ is passed over the Print out – If the complexes fit within the boundaries marked on the ‘stencil’ then you potentially qualify. If your ECG does not meet requirements then it will not be recommended for you to have the S-ICD. There you have it a quick overview of the Boston Scientific S-ICD. From The Heart Institute, Cedars-Sinai Medical Center, Los Angeles, CA (K.N., K.R., A.U.-E., C.T., H.C., E.M., S.S.C. ); and Departments of Pathology (K.G.) and Emergency Medicine (J.J.), Oregon Health and Science University, Portland, OR. Background—The prevalence rates and influencing factors for deployment of primary prevention implantable cardioverter defibrillators (ICDs) among subjects who eventually experience sudden cardiac arrest in the general population have not been evaluated. Methods and Results—Cases of adult sudden cardiac arrest with echocardiographic evaluation before the event were identified from the ongoing Oregon Sudden Unexpected Death Study (population approximately 1 million). Eligibility for primary ICD implantation was determined from medical records based on established guidelines. The frequency of prior primary ICD implantation in eligible subjects was evaluated, and ICD nonrecipients were characterized. Of 2093 cases (2003–2012), 448 had appropriate pre– sudden cardiac arrest left ventricular ejection fraction information available. Of these, 92 (20.5%) were eligible for primary ICD implantation, 304 (67.9%) were ineligible because of left ventricular ejection fraction >35%, and the remainder (52, 11.6%) had left ventricular ejection fraction ≤35% but were ineligible on the basis of clinical guideline criteria. Among eligible subjects, only 12 (13.0%; 95% confidence interval, 6.1%–19.9%) received a primary ICD. Compared with recipients, primary ICD nonrecipients were older (age at ejection fraction assessment, 67.1±13.6 versus 58.5±14.8 years, P=0.05), with 20% aged ≥80 years (versus 0% among recipients, P=0.11). Additionally, a subgroup (26%) had either a clinical history of dementia or were undergoing chronic dialysis. Conclusions—Only one fifth of the sudden cardiac arrest cases in the community were eligible for a primary prevention ICD before the event, but among these, a small proportion (13%) were actually implanted. Although older age and comorbidity may explain nondeployment in a subgroup of these cases, other determinants such as socioeconomic factors, health insurance, patient preference, and clinical practice patterns warrant further detailed investigation. Cardiac resynchronization therapy (CRT) is a multilead pacing device that can extend lives and improve the quality of life of selected patients who suffer from reduced performance of the heart due to adverse timing of contraction (wobbling motion from conduction delays that cause asynchrony or delayed activation of one portion of the left ventricle compared to others reducing net blood ejection). The degree of benefit in CRT responders depends not only on the degree of asynchrony, but also on the delayed activity location in relation to the available locations for lead placement. CRT is an adjustment in the timing of muscle activiation to improve the concerted impact on blood ejection. Only patients likely to improve should be exposed to the risks and costs of CRT. Previous CRT studies enrolled patients with QRS duration >120 or >130 ms for synchronizing biventricular pacing. Additional work confirmed the greatest benefit occurred in patients with QRS durations >150 ms and typical left bundle branch block (LBBB). Conflicting observational and small randomized trials were less clear for patients with shorter QRS durations—the majority of heart-failure patients. What’s more, most cardiologists have seen patients with “modest” QRS durations respond to CRT. In theory, wide QRS is only expected if the axis of significant delay projects onto the standard ECG views, whereas significant opportunity for benefit can be missed if the axis of significant delay is not wide in the standard views. CRT implanters have heard of patients with normal-duration QRS where echo shows marked dyssynchrony. This raised the question: Are there CHF patients with mechanical dyssynchrony (determined by echo) but no electrical delay (as measured by the ECG) benefit from CRT?Unfortunately, echo does not resolve the issue either. Thus there is the residual question of who should be evaluated by a true 3D syncrhony assessment by cardiac MRI. Echocardiographic techniques held promise to identify mechanical dyssynchrony, but like the standard 12 lead ECG, they also utilize limited orientations of views of the heart and hence the directions in which delays can be detected. Cardiac MRI Research (not limited in view angle) by JDPearlman showed that the axis of maximal delay in patients with asynchrony is within 30 degrees of the ECG and echo views in a majority of patients with asynchrony, but it can be 70-110 degrees away from the views used by echocardiography and by ECG in 20% of cases. Hence some patients who may benefit can be missed by ECG or Echo criteria. Echo-CRT was an industry-sponsored (Biotronik) investigator-initiated prospective international randomized controlled trial. All patients had mechanical dyssynchrony by echo, QRS <130 ms, and an ICD indication. CRT-D devices were implanted in all patients. Blinded randomization to CRT-on (404 patients) vs CRT-off (405 patients) was performed after implantation. Programming in the CRT-off group was set to minimize RV pacing. The primary outcome was a composite of all-cause mortality or hospitalization. 1. Although entry criteria for the trial was a QRS duration <130 ms, the mean QRS duration of both groups was 105 ms.
2. The data safety monitoring board terminated the trial prematurely because of an increased death rate in the CRT group. 3. No differences were noted in the primary outcome. 4. More patients died in the CRT group (hazard ratio=1.8). 5. The higher death rate in the CRT group was driven by cardiovascular death. 6. More patients in the CRT group were hospitalized, due primarily to device-related issues. Do not implant CRT devices in patients with “narrow” QRS complexes. The signal of increased death was strong. A hazard ratio of 1.8 translates to an almost doubling of the risk of death. This finding is unlikely to be a statistical anomaly, as it was driven by CV death. The risks of CRT in nonresponders are well-known and include: increased RV pacing, possible proarrhythmia from LV pacing, and the need for more device-related surgery. Patients who do not respond to CRT get none of the benefits but all the potential harms—an unfavorable ratio indeed. Echo is not useful for assessing dyssynchrony in patients with narrow QRS complexes. Dr Samuel Asirvatham explains the concept of electropathy in a review article in the Journal of Cardiovascular Electrophysiology. He teaches us that the later the LV lateral wall is activated relative to the RV, the more the benefit of preexciting the lateral wall with an LV lead. That’s why the benefit from CRT in many cases increases with QRS duration, because—in a majority—a wide QRS means late activation of the lateral LV. Simple triumphs over complicated—CRT response best estimated with the old-fashioned ECG. In a right bundle branch block, the left ventricle is activated first; in LBBB, the LV lateral wall is last, and with a nonspecific ICD, there’s delayed conduction in either the His-Purkinje system or in ventricular muscle. What does a normal QRS say? It says the wave front of activation as projected onto the electric views obtained activates the LV and RV simultaneously. If those views capture the worst delay then they can eliminate the need for resynchrony. Dr Robert Myerburg (here and here) teaches us to make a distinction between trial entry criteria and the actual values of the cohort. Consider how this applies to QRS duration: COMPANION and CARE-HF are clinical trials that showed definitive CRT benefit. Entry required a QRS duration >120 ms (130 ms in CARE-HF). But the actual mean QRS duration of enrolled patients was 160 ms. A meta-analysis of CRT trials confirmed benefit at longer QRS durations and questioned it below 150 ms. CRT guideline recommendations incorporate study entry criteria, not the mean values of actual patients in the trial. Patients enrolled in Echo-CRT had very narrow QRS complexes (105 ms). What to recommend in the common situation when a patient with a typical LBBB has a QRS duration straddling 130 ms is not entirely clear. The results of Echo-CRT might have been different had the actual QRS duration values been closer to 130 ms.
Echo-CRT study reinforces expectations based on cardiac physiology. In the practice of medicine, it’s quite useful to know when not to do something. The trial should not dampen enthusiasm for CRT. Rather, it should focus our attention to patient selection—and the value of the 12-lead ECG. J Cardiovasc Electrophysiol, Vol. 23, pp. 169-171, February 2012. Division of Cardiology, University of Miami Miller School of Medicine, Miami. Australia’s regulatory authority, the Therapeutic Goods Administration (TGA) has issued a hazard alert pertaining to one of Medtronic’s pacing devices, the Consulta® Cardiac Resynchronization Therapy Pacemaker (CRT-P). The alert coincides somewhat with Medtronic’s own issuance of a field safety notice concerning Consulta and Syncra® CRT-P devices. Consulta and Syncra CRT-Ps are implantable medical devices used to treat heart failure. The devices provide pacing to help coordinate the heart’s pumping action and improve blood flow. The two devices are the subject of a global manufacturer recall after Medtronic had identified an issue with a subset of both during production, although as yet there had been no reported or confirmed device failures. However, because of the potential for malfunction, Medtronic is requiring the return of non-implanted devices manufactured between April 1 and May 13, 2013 for re-inspection. Medtronic’s recall is thought to relate to 265 devices, 44 of which have been implanted in the US. The Australian warning letter, issued by the TGA states that only one “at risk” Consulta CRT-P device has been implanted in the country and there have been no reports of device failures or patient injuries relating to this issue. Neither Medtronic nor the TGA are suggesting any specific patient management measures other than routine follow-up in accordance with labelling instructions. A pacemaker/implantable cardioverter defibrillator (ICD) insertion is a procedure in which a pacemaker and/or an ICD is inserted to assist in regulating problems with the heart rate (pacemaker) or heart rhythm (ICD). When a problem develops with the heart’s rhythm, such as a slow rhythm, a pacemaker may be selected for treatment. A pacemaker is a small electronic device composed of three parts: a generator, one or more leads, and an electrode on each lead. A pacemaker signals the heart to beat when the heartbeat is too slow. A generator is the “brain” of the pacemaker device. It is a small metal case that contains electronic circuitry and a battery. The lead (or leads) is an insulated wire that is connected to the generator on one end, with the other end placed inside one of the heart’s chambers. The electrode on the end of the lead touches the heart wall. In most pacemakers, the lead senses the heart’s electrical activity. This information is relayed to the generator by the lead. A ventricular dysrhythmia/arrhythmia (an abnormal heart rhythm caused by a dysfunction of the sinus node, an interruption in the conduction pathways, or the development of another pacemaker within the heart tissue that takes over the function of the sinus node) may be treated with a ventricular pacemaker whose lead wire is located in the ventricle. A new type of pacemaker, called a biventricular pacemaker, is currently used in the treatment of congestive heart failure. Sometimes in heart failure, the two ventricles (lower heart chambers) do not pump together in a normal manner. When this happens, less blood is pumped by the heart. A biventricular pacemaker paces both ventricles at the same time, increasing the amount of blood pumped by the heart. This type of treatment is called cardiac resynchronization therapy. The ICD has another type of treatment for certain fast rhythms called anti-tachycardia pacing (ATP). When ATP is used, a fast pacing impulse is sent to correct the rhythm. After the shock is delivered, a “back-up” pacing mode is used if needed for a short while. The procedure for inserting a pacemaker or an ICD is the same. The procedure generally is performed in an electrophysiology (EP) lab or a cardiac catheterization lab. 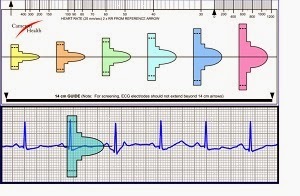 Other related procedures that may be used to assess the heart include resting and exercise electrocardiogram (ECG), Holter monitor, signal-averaged ECG, cardiac catheterization, chest x-ray, computed tomography (CT scan) of the chest, echocardiography, electrophysiology studies, magnetic resonance imaging (MRI) of the heart, myocardial perfusion scans, radionuclide angiography, and ultrafast CT scan. The heart is, in the simplest terms, a pump made up of muscle tissue. Like all pumps, the heart requires a source of energy in order to function. The heart’s pumping energy comes from an indwelling electrical conduction system. An electrical stimulus is generated by the sinus node (also called the sinoatrial node, or SA node), which is a small mass of specialized tissue located in the right atrium (right upper chamber) of the heart. The sinus node generates an electrical stimulus regularly at 60 to 100 times per minute under normal conditions. This electrical stimulus travels down through the conduction pathways (similar to the way electricity flows through power lines from the power plant to your house) and causes the heart’s chambers to contract and pump out blood. The right and left atria (the two upper chambers of the heart) are stimulated first and contract a short period of time before the right and left ventricles (the two lower chambers of the heart). The electrical impulse travels from the sinus node to the atrioventricular (AV) node, where it stops for a very short period, then continues down the conduction pathways via the “bundle of His” into the ventricles. The bundle of His divides into right and left pathways to provide electrical stimulation to both ventricles. This electrical activity of the heart is measured by an electrocardiogram (ECG or EKG). By placing electrodes at specific locations on the body (chest, arms, and legs), a tracing of the electrical activity can be obtained. Changes in an ECG from the normal tracing can indicate one or more of several heart-related conditions. Dysrhythmias/arrhythmias (abnormal heart rhythms) are diagnosed by methods such as EKG, Holter monitoring, signal-average EKG, or electrophysiological studies. These symptoms may be treated with medication or procedures such as a cardiac ablation (removal of a location in the heart that is causing a dysrhythmia by freezing or radiofrequency). 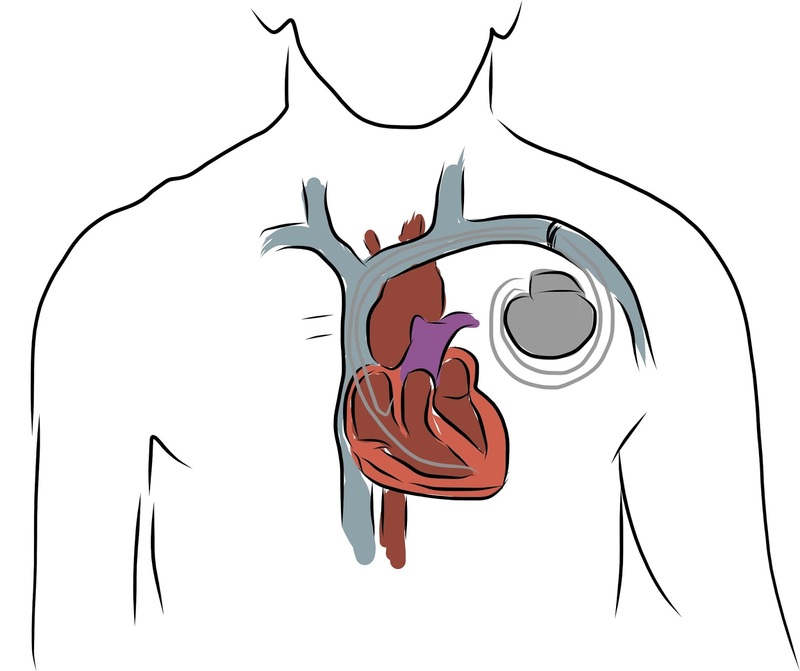 A pacemaker may be inserted in order to provide stimulation for a faster heart rate when the heart is beating too slowly, and when other treatment methods, such as medication, have not improved the heart rate. An ICD may be inserted in order to provide fast pacing (ATP), cardioversion (small shock), or defibrillation (larger shock) when the heart beats too fast. Problems with the heart rhythm may cause difficulties because the heart is unable to pump an adequate amount of blood to the body. If the heart rate is too slow, the blood is pumped too slowly. If the heart rate is too fast or too irregular, the heart chambers are unable to fill up with enough blood to pump out with each beat. When the body does not receive enough blood, symptoms such as fatigue, dizziness, fainting, and/or chest pain may occur. There may be other reasons for your physician to recommend a pacemaker or ICD insertion. If you are pregnant or suspect that you may be pregnant, you should notify your physician. If you are lactating, or breastfeeding, you should notify your physician. Patients who are allergic to or sensitive to medications or latex should notify their physician. For some patients, having to lie still on the procedure table for the length of the procedure may cause some discomfort or pain. You will need to fast for a certain period of time prior to the procedure. Your physician will notify you how long to fast, usually overnight. Notify your physician if you have heart valve disease, as you may need to receive an antibiotic prior to the procedure. Your physician may request a blood test prior to the procedure to determine how long it takes your blood to clot. Other blood tests may be done as well. You may receive a sedative prior to the procedure to help you relax. If a sedative is given, you will need someone to drive you home afterwards. The upper chest may be shaved or clipped prior to the procedure. A pacemaker or implanted cardioverter defibrillator may be performed on an outpatient basis or as part of your stay in a hospital. Procedures may vary depending on your condition and your physician’s practices. You will be placed in a supine (on your back) position on the procedure table. You will be connected to an electrocardiogram (ECG or EKG) monitor that records the electrical activity of the heart and monitors the heart during the procedure using small, adhesive electrodes. Your vital signs (heart rate, blood pressure, breathing rate, and oxygenation level) will be monitored during the procedure. You will receive a sedative medication in your IV before the procedure to help you relax. However, you will likely remain awake during the procedure. The pacemaker or ICD insertion site will be cleansed with antiseptic soap. A local anesthetic will be injected into the skin at the insertion site. Once the anesthetic has taken effect, the physician will make a small incision at the insertion site. A sheath, or introducer, is inserted into a blood vessel, usually under the collarbone. The sheath is a plastic tube through which the pacer/ICD lead wire will be inserted into the blood vessel and advanced into the heart. It will be very important for you to remain still during the procedure so that the catheter placement will not be disturbed and to prevent damage to the insertion site. The lead wire will be inserted through the introducer into the blood vessel. The physician will advance the lead wire through the blood vessel into the heart. Once the lead wire is inside the heart, it will be tested to verify proper location and that it works. There may be one, two, or three lead wires inserted, depending on the type of device your physician has chosen for your condition. Fluoroscopy, (a special type of x-ray that will be displayed on a TV monitor), may be used to assist in testing the location of the leads. Once the lead wire has been tested, an incision will be made close to the location of the catheter insertion (just under the collarbone). You will receive local anesthetic medication before the incision is made. The pacemaker/ICD generator will be slipped under the skin through the incision after the lead wire is attached to the generator. Generally, the generator will be placed on the non-dominant side. (If you are right-handed, the device will be placed in your upper left chest. If you are left-handed, the device will be placed in your upper right chest). The ECG will be observed to ensure that the pacer is working correctly. The skin incision will be closed with sutures, adhesive strips, or a special glue. After the procedure, you may be taken to the recovery room for observation or returned to your hospital room. A nurse will monitor your vital signs for a specified period of time. You should immediately inform your nurse if you feel any chest pain or tightness, or any other pain at the incision site. After the specified period of bed rest has been completed, you may get out of bed. The nurse will assist you the first time you get up, and will check your blood pressure while you are lying in bed, sitting, and standing. You should move slowly when getting up from the bed to avoid any dizziness from the period of bedrest. You will be able to eat or drink once you are completely awake. The insertion site may be sore or painful, but pain medication may be administered if needed. Your physician will visit with you in your room while you are recovering. The physician will give you specific instructions and answer any questions you may have. Once your blood pressure, pulse, and breathing are stable and you are alert, you will be taken to your hospital room or discharged home. If the procedure is performed on an outpatient basis, you may be allowed to leave after you have completed the recovery process. However, if there are concerns or problems with your ECG, you may stay in the hospital for an additional day (or longer) for monitoring of the ECG. You should arrange to have someone drive you home from the hospital following your procedure. You should be able to return to your daily routine within a few days. Your physician will tell you if you will need to take more time in returning to your normal activities. In addition, you should not do any lifting or pulling on anything for a few weeks. You may be instructed not to lift your arms above your head for a period of time. You will most likely be able to resume your usual diet, unless your physician instructs you differently. It will be important to keep the insertion site clean and dry. Your physician will give you specific bathing instructions. Your physician will give you specific instructions about driving. If you had an ICD, you will not be able to drive until your physician gives you approval. Your physician will explain these limitations to you, if they are applicable to your situation. You will be given specific instructions about what to do if your ICD discharges a shock. For example, you may be instructed to dial 911 or go to the nearest emergency room in the event of a shock from the ICD. Ask your physician when you will be able to return to work. The nature of your occupation, your overall health status, and your progress will determine how soon you may return to work. Always carry an ID card that states you are wearing a pacemaker or an ICD. In addition, you should wear a medical identification bracelet that states you have a pacemaker or ICD. Use caution when going through airport security detectors. 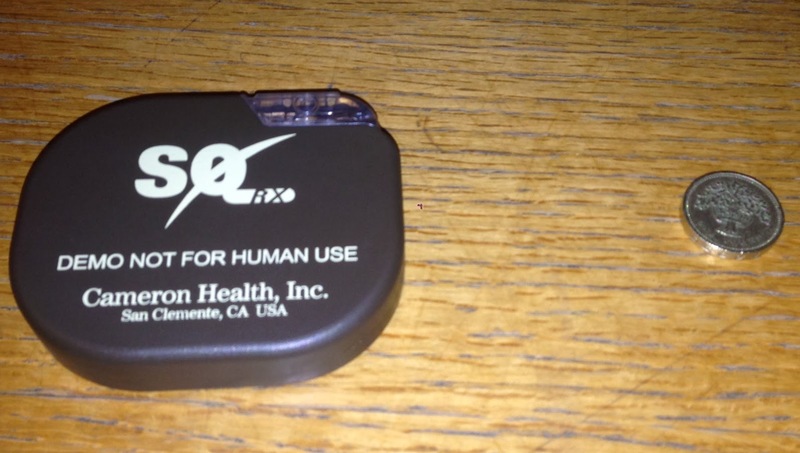 Check with your physician about the safety of going through such detectors with your type of pacemaker. In particular, you may need to avoid being screened by hand-held detector devices, as these devices may affect your pacemaker. You may not have a magnetic resonance imaging (MRI) procedure. You should also avoid large magnetic fields. Abstain from diathermy (the use of heat in physical therapy to treat muscles). Turn off large motors, such as cars or boats, when working on them (they may temporarily €œconfuse” your device). Avoid certain high-voltage or radar machinery, such as radio or television transmitters, electric arc welders, high-tension wires, radar installations, or smelting furnaces. If you are having a surgical procedure performed by a surgeon or dentist, tell your surgeon or dentist that you have a pacemaker or ICD, so that electrocautery will not be used to control bleeding (the electrocautery device can change the pacemaker settings). You may have to take antibiotic medication before any medically invasive procedure to prevent infections that may affect the pacemaker. Always consult your physician if you have any questions concerning the use of certain equipment near your pacemaker. When involved in a physical, recreational, or sporting activity, you should avoid receiving a blow to the skin over the pacemaker or ICD. A blow to the chest near the pacemaker or ICD can affect its functioning. If you do receive a blow to that area, see your physician. Always consult your physician when you feel ill after an activity, or when you have questions about beginning a new activity. In Summary: Who Needs a Pacemaker? Doctors also may recommend pacemakers for people who have certain types ofcongenital heart disease or for people who have had heart transplants. Children, teens, and adults can use pacemakers. other factors to determine your activity level. How likely a device is to disrupt your pacemaker depends on how long you’re exposed to it and how close it is to your pacemaker. You may want to hold your cell phone up to the ear that’s opposite the site where your pacemaker is implanted. If you strap your MP3 player to your arm while listening to it, put it on the arm that’s farther from your pacemaker. You can walk through security system metal detectors at your normal pace. Security staff can check you with a metal detector wand as long as it isn’t held for too long over your pacemaker site. You should avoid sitting or standing close to a security system metal detector. Notify security staff if you have a pacemaker. In most cases, having a pacemaker won’t limit you from doing sports and exercise, including strenuous activities. Your doctor also may ask you to have an EKG (electrocardiogram) to check for changes in your heart’s electrical activity. For more information about clinical trials for children, visit the NHLBI’s Children and Clinical Studies Web page. While working on angiogenesis imaging support at Harvard, the author discovered that injured heart muscle retains gadolinium-based contrast used for perfusion testing (1992). Whereas the gadolinium passes through normal tissue in less than 20 minutes and redistributes mostly to body fat, it stays where cell membranes are damaged, even if the damage is old. The gadolinium then “lights up” the damaged zone when normal heart muscle tissues appear dark by magnetic resonance imaging (MRI). Thus “scar mapping” was born. Prior to that discovery, the standard test for “viability” was a positron emission tomography (PET) scan reporting the presents of absence of normal sugar metabolism in damaged or ischemic heart muscle. PET relies on detection of a pair of gamma rays emitted by a radioactive label in a metabolite. The pair are emitted simultaneously at nearly 180 degrees apart, with a small angulation offset from the momentum of the emitter. The emission event requires a positron finds an electron, so it does not occur precisely where the metabolite sits, and thus has inherently a poor “resolution” (minimal distance where two distinct sources are identifiable as distinct). The protocol for PET assessment of heart muscle viability utilized by the author and other investigators required intravenous infusion of glucose, insulin, and potassium, to assure good delivery of sugar to the healthy viable heart muscle, coupled to repeat blood tests to make sure the blood sugar and serum potassium levels were adequately maintained (otherwise the patient could suffer from low sugar or a potassium-related arrhythmia). Numerous investigatores followed up on this discovery, and determined that a gadolinium demarcated defect less than half the heart wall thickness corresponded clinically to viable myocardium (meaning one could expect improved function after revascularization of a blocked blood supply) whereas a defect more than half the wall thickness corresponded clinically to non-viable myocardium (no expected significant functional gain from revascularizing that region). Subsequently, a third option for assessment of viability was developed: combined PET and MRI. PET/MRI device produced “high-quality cardiac MR imaging acquisitions,” overcoming any technical issues of having the PET detector within the MRI’s 3-tesla magnet field, Nensa and colleagues concluded. “No negative side effects from the integrated imaging system design were observed,” they noted. The researchers were able to show “a close match” between FDG-PET and MRI in assessing myocardial viability and infarct quantification among patients with acute and chronic myocardial infarction. Future studies should investigate whether hybrid FDG-PET/MRI of myocardial infarction can provide additional information compared with MRI or PET alone, according to the authors. Cardiac FDG-PET/MRI is feasible on an integrated whole-body PET/MRI system, but the hybrid modality still must prove it adds clinical relevance to cases of ischemic heart disease, according to a study published online May 7 in Radiology. The study from University Hospital Essen in Germany found good concordance with the simultaneous acquisition of FDG-PET and MR images regarding both cine and late gadolinium-enhanced imaging in patients with myocardial infarction. However, despite the simultaneous MRI and PET acquisition, “consolidated cardiac PET/MRI protocols need to be established, as long examination times associated with fasting seem to compromise patient compliance” with the exams, wrote lead author Dr. Felix Nensa, from the department of diagnostic and interventional radiology and neuroradiology, and colleaguesRadiology, May 7, 2013). The purpose of the study was to determine the feasibility of simultaneous acquisition of cardiac images on an integrated 3-tesla PET/MRI system, and to determine if the placement of the PET detector within the MRI’s field of magnet strength would adversely affect clinical results. The researchers evaluated 20 consecutive patients with ischemic heart disease who were referred for FDG-PET/MRI between May and December 2012. Among the 20 patients, 14 had confirmed acute ST-elevation myocardial infarction within four to 15 days after interventional revascularization, one had suspected non-ST-elevation myocardial infarction, and five had chronic myocardial infarction. Ten of the 20 patients underwent additional cardiac PET/CT before their PET/MRI scan. Individuals with contraindications for gadolinium-based contrast agents and general MRI conditions, such as claustrophobia, were excluded from the study. All patients were asked to detail any personal discomfort or side effects that occurred during the PET/MRI exam. All imaging studies were performed with an integrated whole-body PET/MRI system with 3-tesla field strength (Biograph mMR, Siemens Healthcare) and the PET insert inside the MRI scanner. All MRI sequences were performed with phased-array body surface coils designed for the PET/MRI system. 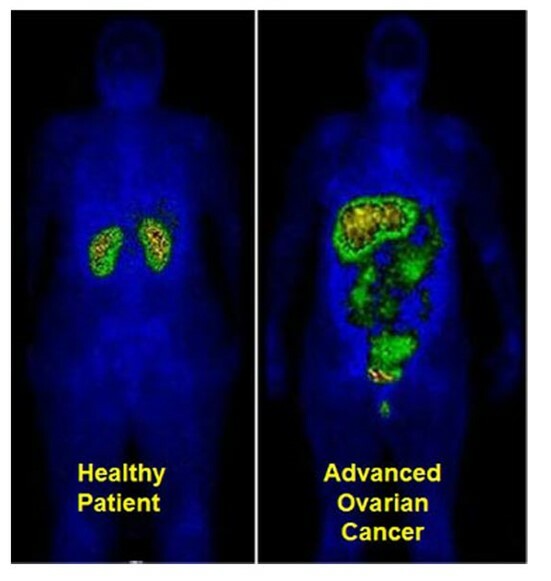 For late gadolinium-enhanced qualitative imaging, patients received gadobutrol (Gadovist, Bayer HealthCare Pharmaceuticals) based on a dosage of 0.2 mmol/kg of body weight. FDG-PET/MRI studies were performed after a fasting period of at least six hours, with FDG administered one hour before imaging with a mean of 202 (± 21) MBq. The scans began at a mean of 129 (± 41) minutes after FDG injection and included an electrocardiographically gated cardiac PET scan with one bed position and 3D image reconstruction. For the FDG-PET/CT scans, an electrocardiographically gated cardiac PET/CT study was performed with a 128-slice CT unit (Biograph mCT, Siemens). PET scans began approximately 70 (± 12) minutes after FDG injection, with a mean of 211 (± 55) MBq. To compare the identification and characteristics of the infarcts between the two hybrid modalities, the researchers mapped the left ventricle with a 17-segment model, as recommended by the American Heart Association. Two-point scoring systems were used to assess myocardial tracer uptake, myocardial wall motion, and myocardial late enhancement in each segment. In addition, the researchers measured the size of a patient’s infarct zone by drawing regions on the late gadolinium-enhanced MR images and PET images, and it was expressed as a percentage of the entire left ventricular myocardium. Nensa and colleagues were able to complete 19 of 20 cardiac PET/MRI scans. One patient with ST-elevation myocardial infarction did not finish due to claustrophobia. Total PET/MRI scan time without patient preparation and positioning was 53 (± 3) minutes, and all cardiac MR images were rated as diagnostic in quality. The analysis of FDG-PET and MRI with the 17-segment model found “good concordance” of the left ventricle with both cine imaging and late gadolinium-enhanced imaging in 18 of the 19 patients. Of the 306 segments evaluated, 97 (32%) were rated as infarcted on PET images, compared with 93 (30%) rated as infarcted on late gadolinium-enhanced images and 90 (29%) on cine images. Two-chamber views show “stunned myocardium” in a 66-year-old patient with ST-elevation myocardial infarction and acute occlusion of the left anterior descending artery. Cardiac PET/MRI was performed seven days after intervention. Late gadolinium-enhanced image (top left) shows no infarction zone. 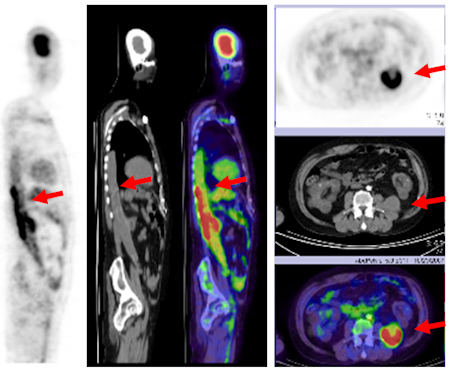 Fused late gadolinium-enhanced and PET images (top right) show that tracer uptake was reduced in segments 13-15 and 17. T2-weighted MR image (bottom left) shows myocardial edema (arrows) that corresponded well with the area of reduced tracer uptake on the bottom right image. All images courtesy of Radiology. The size of the infarct zones averaged 22% of the entire left ventricular myocardium on PET images, compared with an average of 20% on late gadolinium-enhanced images. Among the subgroup of 10 patients with an additional PET/CT scan, no significant difference in myocardial tracer uptake between PET/CT and PET/MR images was found. In patient exit interviews, 16 patients cited long examination times (including patient preparation) as a source of discomfort. In addition, 11 patients cited the PET/MRI exam itself, i.e., noise, narrowness, and immobility, while 15 patients did not like having to fast. In summary, the PET/MRI device produced “high-quality cardiac MR imaging acquisitions,” overcoming any technical issues of having the PET detector within the MRI’s 3-tesla magnet field, Nensa and colleagues concluded. June 7, 2011 — SAN ANTONIO – The first-ever study on the clinical use of PET/MRI and a breakthrough on the use of FDG-PET to detect fevers of unknown origin were among the top research papers outlined Monday at this week’s Society of Nuclear Medicine (SNM) annual meeting. More than 1,000 papers were submitted for consideration and presentation at this year’s meeting, with many studies showing how molecular imaging is gaining influence in the early detection of Alzheimer’s disease. Other submissions included a first-of-its-kind study on the use of near-infrared fluorescence and a new synthesized imaging agent to discover hidden blood clots in veins and arteries. Early results from the clinical use of PET/MRI indicate that the hybrid modality can provide important diagnostic information about soft tissues and physiological functions throughout a patient’s body. The technology’s ability to find suspicious lesions and potential cancer already appears comparable to that of conventional molecular imaging methods. 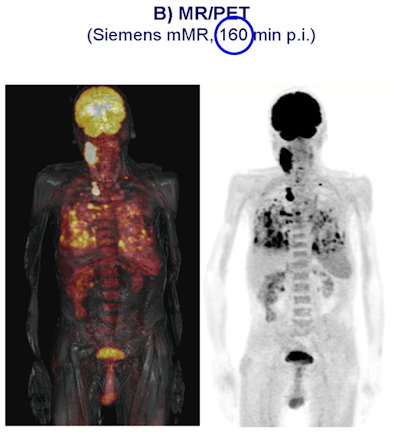 In a German study, 11 patients with cancer underwent single-injection PET/CT followed by PET/MRI (Biograph mMR, Siemens Healthcare). Simultaneous PET/MRI acquisition was feasible and offered good-quality PET and MRI diagnostic data. The analysis found that all 13 lesions detected at PET/CT were also identified by PET/MRI, with no significant difference between PET/CT and PET/MRI regarding the uptake ratios. The study “demonstrates for the first time that newly introduced integrated whole-body MR/PET technology allows simultaneous acquisition of high-quality MR and PET data in a clinical setting within an acceptable time frame,” wrote lead study author Dr. Alexander Drzezga from TU München. The hybrid technology could result in the development of new imaging agents that combine the diagnostic prowess of PET and MRI, Drzezga said. With the ability to image physiologic and pathophysiologic processes at the same time, the technology could open a new imaging discipline within nuclear medicine. 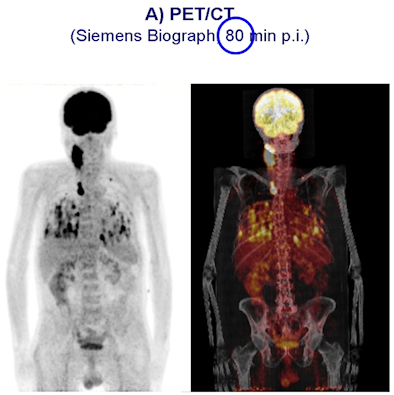 Carcinoma is compared in a patient who received a PET/CT scan 80 minutes after contrast injection (above), followed by a PET/MRI scan 160 minutes after contrast injection (below). All images courtesy of SNM. Japanese researchers broke new ground in their study, which concluded that FDG-PET provided additional diagnostic information in cases of fever of unknown origin. The use of FDG-PET also had a high clinical impact, especially among patients with infectious diseases. The retrospective study evaluated 81 consecutive patients with fever of unknown origin. They underwent FDG-PET at six Japanese institutions between July 2006 and December 2007. Results were divided into four groups for final diagnoses: infection, arthritis/vasculitis/autoimmune/collagen disease, tumor/granuloma, and other/unknown. The analysis found that sensitivity was highest in the tumor/granuloma group at 100% (seven of seven cases), followed by infection at 89% (24 of 27 cases) and arthritis/vasculitis/autoimmune/collagen disease at 65% (11 of 17 cases). Sensitivity was 0% (zero of one case) in the other/unknown category. Overall sensitivity was 81% and overall specificity was 75%. Additional information provided by FDG-PET was highest in the infection group, at 76% of the cases (22 of 29), followed by tumor/granuloma at 75% (six of eight), arthritis/vasculitis/autoimmune/collagen disease at 43% (nine of 21), and other/unknown at 23% (five of 22). The other/unknown group showed a high specificity of 84% (16 of 19 cases) and accurately excluded active focal inflammatory diseases and malignancy. Lead study author Dr. Kozuo Kubota, PhD, chief of nuclear medicine at the National Center for Global Health and Medicine in Tokyo, said that until now, conventional modalities have produced low imaging resolution and very poor detectability for the fever’s cause. With the addition of FDG-PET, physicians discovered a graft infection in a 50-year-old male with kidney failure and fever of unknown origin, with high FDG uptake illustrating the malady. “This is a huge step forward and I think it will change how we approach this problem,” he said. Three studies presented at SNM 2011 added to the growing evidence that PET is an effective method to detect Alzheimer’s disease in its early stages, and that it provides a pathway to future clinical screening and treatments. One lead study author, Dr. Kevin Ong, research scientist at Austin Hospital in Heidelberg, Australia, said that amyloid imaging with PET scans can help ascertain the likelihood that individuals will deteriorate cognitively within a few years, enabling more efficient channeling of healthcare resources. Molecular imaging of Alzheimer’s disease has focused on detecting and analyzing the formation of the protein beta amyloid in the brain, which researchers say is directly involved in the pathology of Alzheimer’s. The presence of significant amyloid buildup is also linked to more rapid memory decline and brain atrophy. Increased amyloid is bad for cognition even in the healthy elderly, noted lead study author Michael Devous Sr., PhD, director of neuroimaging for the Alzheimer’s Disease Center at the University of Texas Southwestern Medical Center. The three ongoing studies involve several years of research based on hundreds of participants ranging widely in age, cognitive ability, and stage of disease. Collective results showed that amyloid plaques build up at an estimated rate of 2% to 3% per year, and they often are already present in healthy older individuals. Amyloid plaque was present in 12% of people in their 60s, 30% of those in their 70s, and 55% of those older than 80. In one study, approximately 25% of subjects older than 60 had amyloid plaques. For individuals who have already developed a measurable memory decline, a positive scan for amyloid is the most accurate predictor of progression to Alzheimer’s disease, said Dr. Christopher Rowe, a lead investigator for the Australian Imaging, Biomarkers, and Lifestyle study of aging and professor of nuclear medicine at Austin Hospital. Amyloid imaging with PET scans, he added, will be an important new tool in the assessment of cognitive decline. Several studies have used carbon-11-labeled Pittsburgh Compound B (C-11 PIB), a PET imaging agent that binds to beta amyloid in brain tissue, but two of the current studies are assessing the benefit of F-18 florbetaben and F-18 florbetapir, which are designed for routine clinical use. Both F-18 florbetaben and F-18 florbetapir are showing promise as reliable predictors of progression to Alzheimer’s disease, and F-18 amyloid imaging agents are considered most likely to move into clinical practice in the near future, perhaps as soon as next year. 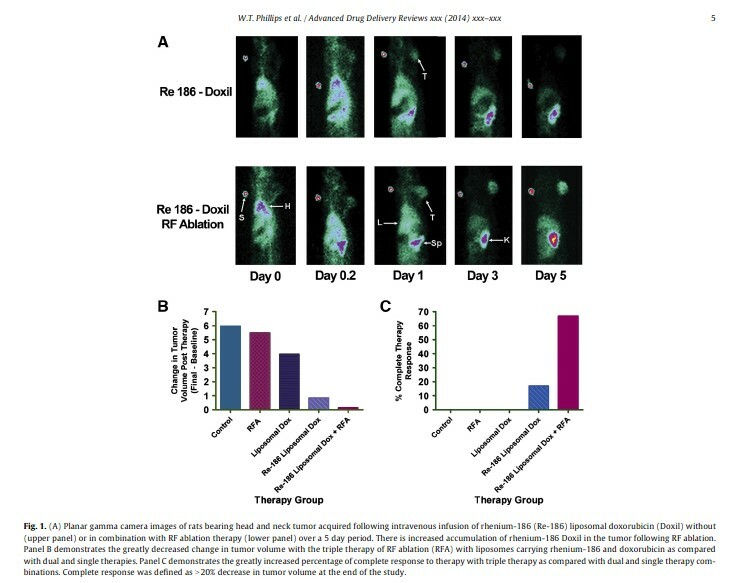 In another novel study at SNM 2011, researchers from Massachusetts General Hospital are using near-infrared fluorescence (NIRF) and a new synthesized imaging agent to detect blood clots inside elusive veins, often within the deep tissues of the thighs and pelvis. The agent uses a biomarker that seeks out a peptide — called fibrin — that is actively involved in the formation of blood clots. Combined with NIRF, which uses light energy to gather information from cells and tissues, the technique could also be used for coronary arteries. The fibrin peptide agent (EP-2104R) has already been tested in phase II clinical trials. Lead study author Dr. Tetsuya Hara, PhD, noted that the availability of a high-resolution fibrin sensor is important for two reasons: intravascular NIRF imaging of coronary-sized arteries is now possible, and coupling the fibrin peptide with this technique may allow researchers to study coronary artery plaques and stents, which could potentially help identify patients at increased risk of heart attack. The researchers were able to successfully detect fibrin-rich deep vein thrombosis with both intravital fluorescence microscopy and noninvasive fluorescence molecular tomography, allowing information to be acquired about tissues by analyzing how light is absorbed and scattered. By coupling the fibrin peptide agent with intravascular NIRF imaging, researchers can now study microthrombi on coronary artery plaques and coronary stents that are at high risk for thrombosis and vessel occlusion. This advance could help clinicians predict potential heart attacks and other major cardiovascular events, potentially saving more patients’ lives. In results that add substantial forensic power to identifying the cause of death, postmortem cardiac 3-tesla MRI has been found to identify sudden cardiac death in cases that are invisible at conventional autopsy, according to new research published online in the Journal of the American College of Cardiology. In 76 cases, unenhanced MRI was able to visualize and discriminate 124 myocardial lesions, and there was excellent correlation among autopsy findings on chronic, subacute, and acute cases at MRI, the study authors said. Thus, 3-tesla MRI can visualize chronic, subacute, and acute myocardial infarction in situ, and shows a possible source for sudden cardiac death in peracute infarction, wrote Dr. Christian Jackowski from the University of Bern in Switzerland, along with colleagues from the University of Lausanne in Switzerland and Linköping University in Sweden. In particular, peracute infarction findings cannot be replicated in a physical autopsy; therefore, the study findings supports the use of forensic autopsy by permitting targeted histology, the group reported. 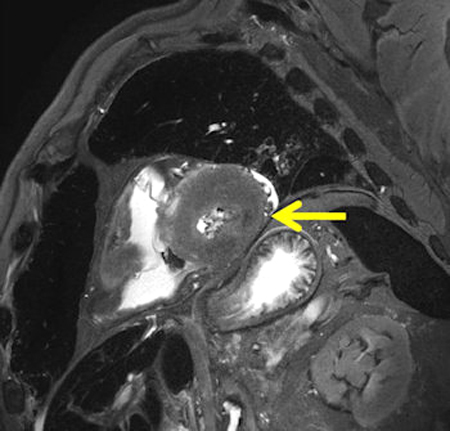 Thus, MRI may serve as an alternative postmortem examination technique to traditional autopsy, Jackowski and colleagues wrote (JACC, April 3, 2013). Considering that cardiac events account for most deaths, postmortem MRI’s ability to demonstrate the cause of death in the heart has an enormous potential benefit, the group wrote, noting that “tissue alterations occurring during and after myocardial ischemia” are the most important — yet the least understood — issue with regard to conventional autopsy. In previous small studies, acute, subacute, and chronic infarction have been differentiated based on signal behavior in T1- and T2-weighted images. Previous research has also suggested that unenhanced T2-weighted images without a hyperintense margin may represent acute ischemic lesions, which are aged between about 15 minutes and one hour, the group noted. Generally, though, cases of sudden cardiac death without myocardial findings of fresh thrombus have puzzled examiners and pathologists for decades. The study sought to validate previous findings using postmortem MRI at 1.5 tesla, and also sought to use a larger study population. A secondary goal was to link the MRI finding of T2-weighted myocardial hypointensity to the possible myocardial appearance of sudden death to the patient’s coronary status at autopsy. The group used 3-tesla MRI to examine 136 corpses whose case histories showed chronic or acute cardiac anamnesis, or death from circumstances suggesting a cardiac origin. All cases were examined with MRI using acquired short-axis and horizontal long-axis imaging on a 3-tesla MRI system (Achieva, Philips Healthcare) using a 16-channel torso coil. Peracute myocardial infarction in postmortem MRI (death within one hour). A T2-weighted short-axis image presents with a local hypointensity within the lateral wall without hyperintense edematous margin. Autopsy of the specimen showed no visible alteration within the affected myocardium (not shown). Histology also failed to demonstrate ischemic alterations (not shown). Dissection of the coronary artery system revealed a fresh soft-plaque rupture with intimal hemorrhage within the circumflex coronary artery (not shown). Image courtesy of Dr. Christian Jackowski. A total of 76 cases (62 men, 14 women; mean age at death 57.8 ± 16.7) presented with cardiac findings at postmortem MRI were investigated further. Findings of cloudy hypointense myocardial areas in T2-weighted images without any hyperintense marginal edematous reaction were diagnosed as peracute ischemic lesions, and were not visible at autopsy, Jackowski and colleagues wrote. Among the 76 cases, postmortem analysis identified 124 myocardial lesions (chronic = 25, subacute = 16, acute = 30, and peracute = 53), the team wrote. They found excellent correlation among myocardial findings at autopsy and chronic, subacute, and acute infarction cases. Peracute infarction areas detected at postmortem MRI were verified by histology in 62.3% of cases, and could be related to a matching coronary finding in 84.9%, they wrote. In 15.1% of peracute lesions seen at MRI, the researchers found no matching coronary finding. But these patients presented severe myocardial hypertrophy or cocaine intoxication that “facilitated a finding of cardiac death without a verifiable coronary stenosis,” they noted. Postmortem 3-tesla MRI revealed chronic, subacute, and myocardial infarction, the authors concluded, and in cases of peracute infarction, MRI pinpoints the possible source of sudden cardiac death, demonstrating affected myocardial areas at autopsy, Jackowski and colleagues wrote. The study is the first to amass a large number of cases presenting with hypointense T2-weighted lesions that are well-correlated to coronary events; among the 42 cases, there were 53 hypointense T2-weighted lesions that remained invisible at macroscopic dissection, the authors wrote. At MRI, no histological alteration could be seen within the affected myocardium in 37.7% of the cases, the authors cautioned. On the other hand, a comparison of hypointensity in MRI to coronary status at autopsy showed findings that were able to explain an ischemic situation within the myocardium in 84.9% of the cases, demonstrating solid value for the postmortem imaging technique. In daily practice, this suggests that MRI could explain the majority of unsatisfactory autopsy cases thought to be sudden cardiac death but without verifiable myocardial changes. Among the study limitations cited by the authors, the design did not permit the use of a control group, and the researchers were not blinded to the results, they stated, adding that the gold standard, autopsy, has several known limitations that hamper comparison with imaging. Postmortem cardiac imaging comes with the disadvantage of no late enhancement. But it may be more than compensated for by the lack of cardiac motion or breathing artifacts. Magnetic Resonance Imaging (MRI) is increasingly used in clinical diagnostics, for a rapidly growing number of indications. 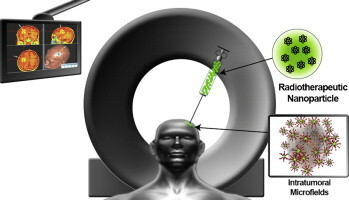 The MRI technique is non-invasive and can provide information on the anatomy, function and metabolism of tissues in vivo (Strijkers GJ, et al, Anticancer Agents Med Chem, May 2007;7(3):291-305). Basic contrast in the MRI image scans is as a result of contrast generated by differences in the relaxation times between different regions. Since the intrinsic contrast generated between regions is limited to allow clear and specific diagnosis, MRI contrast agents administered intravenously are increasingly being used to alter image contrast. Gadoxetic acid, a gadolinium-based compound, is a recently developed hepatobiliary-specific contrast material for MRI that has high sensitivity in the detection of malignant liver tumors. Its salt, gadoxetate disodium, is marketed as Primovist in Europe and Eovist in the United States by Bayer HealthCare Pharmaceuticals. Gadoxetic acid is taken up by hepatocytes and then excreted into the bile ducts (Schuhmann-Giampieri G, et al, Radiology, Apr 1992;183(1):59-64). Therefore, hepatic focal lesions without normal hepatobiliary function are depicted as hypointense areas compared with the well-enhanced hyperintense background liver in the hepatobiliary phase of gadoxetic acid–enhanced MR imaging. In addition, gadoxetic acid can be used in the same way as gadopentetate dimeglumine to evaluate the hemodynamics of hepatic lesions in the dynamic phase after an intravenous bolus injection (Kitao A, et al, Radiology, Sep 2010;256(3):817-26). Research significance: HCC is the most frequent primary malignant tumor of liver and is the third most common cause of cancer death worldwide. It is the most Hepatocellular. The accurate detection and characterization of HCC focal lesions is crucial for improving prognosis of patients with HCC. Research problem: Gadoxetic acid–enhanced MR imaging is highly accurate for diagnosing HCC lesions. As discussed earlier, in this imaging process, hepatic focal lesions without normal hepatobiliary are hypointense as compared with the well-enhanced hyperintense background liver. However, approximately 6%–15% of hypervascular HCCs demonstrate isointensity or hyperintensity (Kitao A, et al, Eur Radiol, Oct 2011;21(10):2056-66). Hypothesis: The reason for hyperintensity in some HCC lesions was previously shown to be due to overexpression of organic anion transporting polypeptide 8 (OATP8) (Kitao A, et al, Radiology, Sep 2010;256(3):817-26). The authors speculated that there might be a correlation of the tumor marker production and signal intensity (SI) on hepatobiliary phase images, which would reflect distinct genomic and proteomic expression of HCC. Thus, authors stated that “the purpose of this study was to analyze the correlation among the pathologic and biologic features, tumor marker production, with signal intensity (SI) on hepatobiliary phase gadoxetic acid–enhanced MR images of HCC” (Kitao A, et al, Radiology, Dec 2012;265(3):780-9). Experimental design: From April 2008 to September 2011, 180 surgically resected HCCs in 180 patients (age, 65.0 years ± 10.3 [range, 34–83 years]; 138 men, 42 women) were classified as either hypointense (n = 158) or hyperintense (n = 22) compared with the signal intensity of the background liver on hepatobiliary phase gadoxetic acid–enhanced MR images (Abstract of the study). Alpha fetoprotein (AFP) – is a main tumor marker of HCCs. AFP is the most abundant plasma protein found in the human fetus and plasma levels decrease rapidly after birth. A level above 500 nanograms/milliliter of AFP in adults can be indicative of hepatocellular carcinoma, germ cell tumors, and metastatic cancers of the liver. Absence of protein induced by vitamin K or antagonist-II (PIVKA-II) – is a clinically important serum tumor marker. PIVKAII is an incomplete coagulation factor prothrombin II whose production is related to the absence of vitamin K or the presence of the antagonist of vitamin K, which is the cofactor of g carboxylase that converts precursor into prothrombin. Serum levels of both AFP and PIVKA-II correlate with HCC malignancy and prognosis (Miyaaki H, et al, J Gastroenterol, Dec 2007;42(12):962-8). hypointense HCCs (P = .003, .004, and .026). In addition, immunohistochemical analysis revealed that the expression of FP and PIVKA-II was lower in hyperintense than in hypointense HCCs (both P < .001). Also, hyperintense HCCs showed lower recurrence rate than hypointense HCCs (P = .039). Conclusion: Variation was observed within differently stained lesions of HCC in the hepatobiliary phase gadoxetic acid–enhanced MR images as evident in tumor marker expression, proliferation pattern, differentiation grade, immunohistochemical analysis and recurrence. The results lead to the hypothesis that hyperintense HCCs in the hepatobiliary phase gadoxetic acid–enhanced MR images might represent a particular type of HCC that is hypervascular and biologically less aggressive as compared to hypovascular HCCs. Interestingly, this research is another great example where tumor heterogeneity has been brought to light (similar to genetic heterogeneity in triple negative breast cancer deciphered by Lehmann BD, et al, 2011). The heterogeneity might be the basis of answers to why a particular therapy fails in a certain tumor type and fortifying evidence for appropriate analysis of the tumor for obtaining the desired tumor response from a particular drug.